This article explains how to print a single label through SolidShip by providing an order identifier, such as a Market Order Number or SKU. Many people print individual labels as a supplement to scanning or bulk printing. We recommend reviewing each method before deciding on a workflow. For more information, see The Three Most Common Methods of Printing Shipping Labels. When printing individual labels, most businesses pick their ordered items before printing their shipping labels. To make picking easy, you can print pick lists or packing slips from your Solid Commerce account. Pick lists arrange ordered items by their Storage Location, streamlining your pickers' trip through the warehouse. Packing slips also display the Storage Location. Picking items first allows you to box items and adjust shipping weights as you print. See the Related Articles section to learn more about printing pick lists and packing slips, including how to organize your packing slips by Storage Location when you print them. 1) Before you print labels, you must set up the SolidShip Shipping Tool. For instructions, please see Setting Up the SolidShip Shipping Tool. 2) Shipping Rules are not required, but using them allows you to automate your label printing. When you enter a Market Order Number, SC Sale ID (SC Order ID), SKU, or UPC, SolidShip will automatically select the correct shipping method and print a label based on the options you saved in your Shipping Rules. For more info, see Creating Shipping Rules to Automate Your Shipping. NOTE: Orders must have a Paid status in Solid Commerce to print labels through SolidShip. 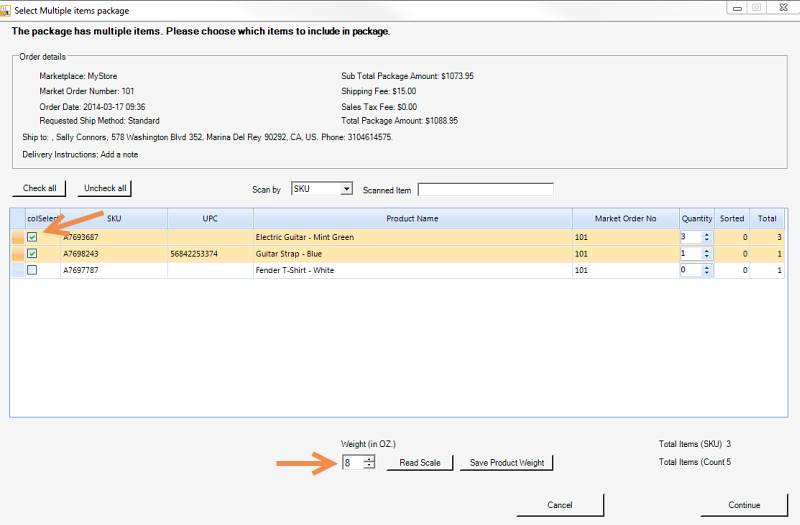 1) Copy the Market Order ID, SC Sale ID, SKU, or UPC from the Order Manager of Solid Commerce. If you are not familiar with how to locate these values, see Getting Started with Order Management - An Overview of the Manage Orders Page. Instead of copying numbers out of the user interface, you can also look at the packing slip and type the SC Sale ID into SolidShip. You can search for SolidShip through your computer's Start menu or find the .exe file on your computer's Local Disk (C:) -> Program Files (x86) -> SolidCommerce -> SolidShip. 3) In the drop-down menu in the upper left-hand corner of SolidShip, select Market Order ID, SC Sale ID (SC Order ID), SKU, or UPC to indicate which value you are going to enter. 4) If you would like to verify the order information before you print the label, check the Enable products confirmation box. If you enable this option, a confirmation window will appear when you attempt to print a label. In the window, you can adjust the shipping weight, continue with printing, or cancel the print. As a note, the confirmation window will open by default when you ship multiple-item orders. This allows you to confirm that you've included all the products in the order, or you can proceed with a partial shipment. Select the items you will ship, adjust the weight if necessary, and click Continue. 5) If you are not using Shipping Rules, enable the Override shipping provider, Override Shipping Profile, Override shipping method, and Override package type options. Select your shipping options from the drop-down menus. NOTE: If you are using the shipping overrides, you must provide a package type. Generally, USPS Package (Rectangular) works well for non-flat rate US Postal shipments, and Custom Packaging works well for UPS and FedEx. 6) If you are using a USB scale, enable the Override total weight option, and place your product on the scale. For assistance setting up your scale, see Connecting & Using a USB Scale With the SolidShip Shipping Tool. 7) Enter your order identifier in the empty search bar at the top of SolidShip. 6) Click the Go button. If you provide a SKU or UPC, SolidShip will print a label for the oldest Paid order containing your item. Alternatively, you may provide the SC Sale ID or Market Order Number if you would like to print a label for a specific order. Once a label successfully prints, Solid Commerce will automatically mark the order as Shipped and report the tracking information to the marketplace. If you ship the order in multiple packages, the order status will update to Partially Shipped until you ship all the items in the order.